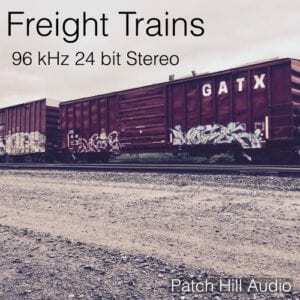 Freight trains passing (looped), horns close and distant, engines idling, engines passing, local trains passing, cars banging, rails scraping, hydraulics, rolling to stop, radio communications and more. Gear Used: Sound Devices 633, Schoeps CMC6(pair), Schoeps MK2(pair) and Schoeps CMXY 4V. RME Fireface802, Steinberg Nuendo, Steinberg Wavelab, Waves Mercury Bundle.